A brand new outdoor season starts on May 6 and we’ve got a brand new market layout for you. 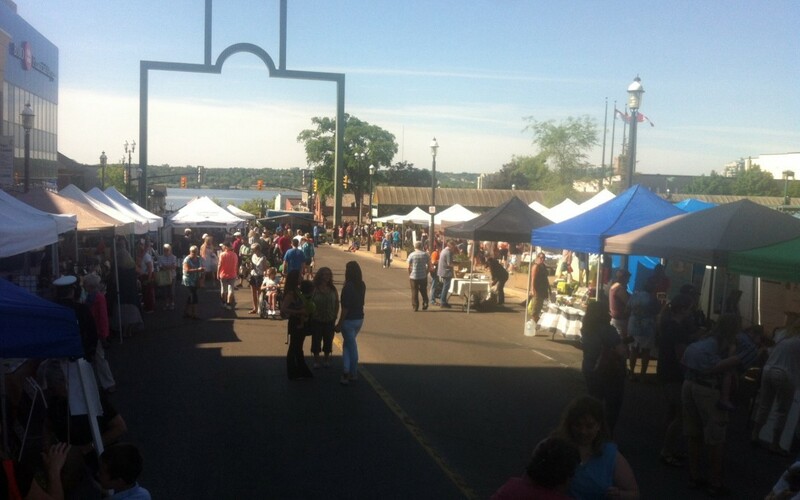 It’s a Mulcaster Street Market every weekend this summer at the Barrie Farmers’ Market. The market is taking over Mulcaster Street from the City Hall parking lot entrance to the Collier Street archway, meaning there will be lots of extra space to make the experience more comfortable for customers. Where are your favourite vendors? Many vendors on the Mulcaster Street sidewalk are in the same place as last year, but the rest have moved onto the street or swapped places on the covered walkway. We also fit in guest vendors and community groups on a week-by-week basis, so have some fun and explore the market! The Barrie Farmers’ Market booth will always have a map displayed showing the locations vendors and guest groups for the current week. Helping us start the season are the familiar musical duo of Lee & Steve. The Fung Loy Kok Institute of Taoism will also be on hand for a tai chi demonstration and the Huronia Rose Society will be selling potted rose plants as part of their annual fundraiser. Don’t miss it! The Barrie Farmers’ Market is open every Saturday, rain or shine, all year round from 8 a.m. to 12 p.m. From the beginning of May through the end of October you’ll find us outside of city hall at the intersection of Collier and Mulcaster Streets.